Polyester summer suits are all the rage during the warm months of summer. Polyester is a lighter material than traditional wool suits so they weigh much less. 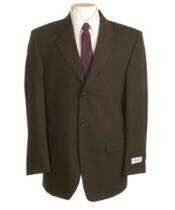 Polyester suits come in a variety of bright colors since wool suits are normally conservative in color. Just because it is summer does not mean you cannot wear a suit. 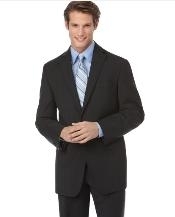 Polyester summer suits are a lightweight option and hold up to water well. Water will not damage a polyester suits like it will damage a wool suit. 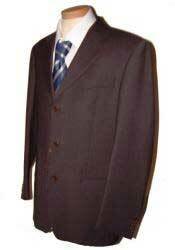 Polyester summer suits come in the popular 2 button style that are seen today all over the world! 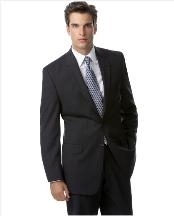 A 2 button suit exudes style and confidence in a variety of situations and circumstances. 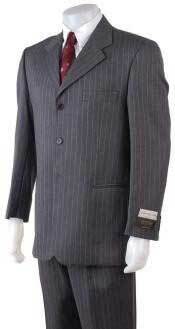 2 button polyester summer suits come either with pleated pants flat front pants. No matter what style of pants you choose you will be the center of attention at whatever event you are attending in the summer time. A polyester summer suit is just the garment to make you stand out in a crowd and comes in many, many colors and styles that you can choose from. 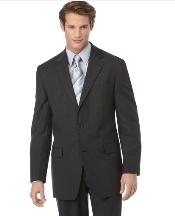 The jacket of a polyester summer suit can also be worn separately as a blazer. This makes a polyester summer suit a very versatile component of your wardrobe and can be dressed up or down. The polyester summer suit can be worn with a neck tie or without one, it is up to you! You will look stunning in whatever suit you choose to wear this summer and will beam with confidence! 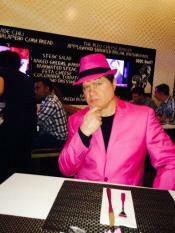 One advantage of polyester summer suits is that they come in a variety of bright colors. Royal blue is one of the more popular suits for the summer. 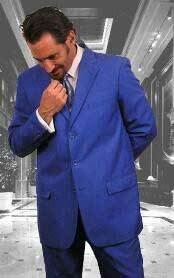 A royal blue polyester summer suit is a bright color that helps you breathe life into any event during the warm months. As a bonus, you can wear the royal blue blazer as a stand alone fashion statement pairing it with white slacks. This attire would be appropriate for either the yacht club or a summer outing at the park. A lightweight polyester summer suit allows you to look your best without the added weight and warmth of one of your traditional suits that are hanging in your closet. 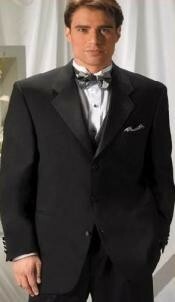 A polyester summer suit can be worn for outdoor weddings as well. These suits come in a variety of light colors that can be coordinated for any wedding and can match up nicely with the color of the bridesmaids dresses as well. A white suit is always a popular choice for a groom at his wedding. White is the predominant color chosen for mens wedding suits and are available in many styles and all made in polyester for a light weight feel and comfort. 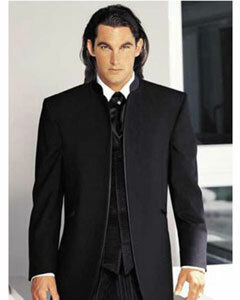 The white wedding suits offered come in a variety of styles and even come in a long zoot suit. The long zoot suit style lends itself very good for weddings and the longer jacket makes for a unique appearance of the wedding party photos. 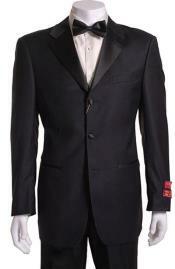 The zoot suit themed wedding is becoming more and more popular and is made in a lightweight summer polyester material. So the sky is your limit when it comes to styles available for polyester summer suits. 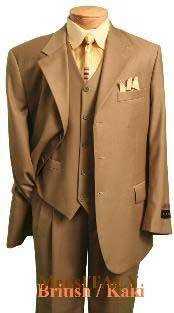 Polyester summer suits are also easy to take care of as they hold their color well under multiple dry cleanings. The bright colors of the polyester summer suits maintain their look for many years of wearings and are one of the most comfortable suits that you can buy! These suits and their many colors are one of the best bargains in the wonderful world of suits and you will not be disappointed with the quality of these polyester summer suits! 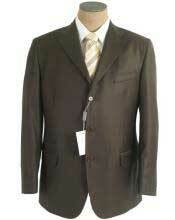 Value is another aspect that makes polyester summer suits very appealing. 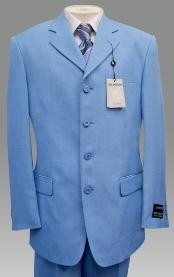 A nice quality polyester summer suit will not break the bank when it comes to price. 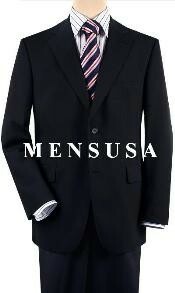 Polyester summer suits start at the incredible price of $79 for a very basic solid color 3 button suit. 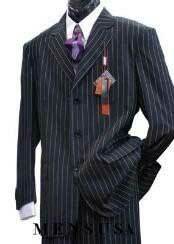 For a little more money you can get the suit with a vest or with pinstripes as well. Just because the price is low it does not mean the quality suffers. A polyester summer suit is one of the best bargains on the market when it comes to great looking suits!